Actions at the park are driven by pragmatism. Each centre provides its expertise and shares it with the rest. Our highly qualified platform and service staff provides, not only technical assistance, but scientific advice to researchers in order to optimise the use of these facilities and make the most of their experiments. We continuously explore new and emerging technologies according to the needs of the scientists and have so far achieved a very high usage through the sharing of our sophisticated and expensive instruments. scientific community being from outside Spain. The cooperative model of organisation with common areas facilitates the interrelationships between the centres and the joint advanced scientific and technical services. The animal facility of the park is outstanding and considered one of the most up-to-date in Europe, as are other services at the centres including advanced light microscopy, proteomics and flow cytometry. animal models are zebrafish and mice, but it is also possible to use rats, hamsters, rabbits, frogs and axolots. The animal facility covers 4,500 m2 with six independent units, which are connected and run under a single management. (1) The aquatic animal area (zebra fish and Xenopus). (2) The specific pathogen germ free (SPF) barrier zone for rodents, with modern auto-ventilated microisolators and three support laboratories. (3) A transgenesis area with large laboratories (250 m2) for the production of genetically modified mice. (4) The experimental area with laboratories, surgery rooms and an irradiator. (5) The quarantine area with its own access changing rooms and embryonic transfer re-derivation laboratory (6) A conventional animal facility, located at an adjacent building, which is connected via a tunnel with the PRBB, and has a surface area of 1,300 m2, mainly for studies with animal models in neuropharmacology and immunology. The Ethical Committee of Animal Experimentation of the PRBB (CEEAPRBB) has more than 200 different procedures approved. Its main objective is the legally required evaluation of all experimental procedures involving animals, taking into account, when possible, alternative methods to the use of animals. his unit aims to provide instruments covering the whole application spectrum of advanced light microscopy. The service includes the use of a number of advanced light microscopy systems, equipment for sample preparation and maintenance prior to imaging and resources for the subsequent processing of the image data. The staff assists researchers in the experimental planning of experiments and provides the in-depth training for the operation of the microscopes and for specific imaging techniques. Support is also provided in the processing, rendering and analysis of the datasets. Custom analysis can be designed. The equipment of the unit includes 6 confocal microscopes, 2 automated widefield fluorescence microscopes and 1 macro zoom fluorescence microscope. It is currently one of the best equipped microscopy units in Europe. access facilities which are equipped with the security control mechanisms necessary to ensure the correct storage of the biological samples, their confidentiality and their traceability in accordance with all the Spanish ethical and legal regulations. The Biobank Service is certified by AENOR to ISO 9001:2008.
he Clinical Research Unit has 12 beds and capacity to run different studies at same time. The equipment is especially suitable for phase I clinical trials in drug development, for bioequivalence studies or for nutritional interventions. The studies are performed in accordance with the Good Clinical Practice (GCP) standards. It is accredited by the Government of Catalonia. The Ethics Committee for Clinical Research (CEIC-Parc de Salut Mar) evaluates the study protocols in accordance with Spanish and European regulations. The Committee has two regular meetings every month. 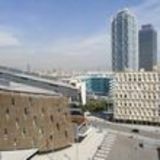 It is accredited by the Government of Catalonia and the Spanish Medicines Agency. his unit provides PRBB researchers with the technical expertise and training to access the state-of-theart instrumentation, as well as advice to develop reliable flow cytometric assays with the highest quality control standards and productivity. It supports the use of a wide range of flow cytometry applications and new ones are implemented responding to the facility needs or upon user demand. he scope of the CRG Genomics Unit is to provide excellent, stateof-the-art services in the fields of microarray technology and next-generation sequencing. Furthermore, the unit is dedicated to test, implement, and to develop new protocols (wet lab and bioinformatics) to advance in the analysis of genes and genomes. techniques by means of GeneChip array hybridisation (SAM Affymetrix platform). The facility, except for the microarray service, is located in the Molecular Cytogenetics Laboratory of the Pathology Service at the Hospital del Mar. he CRG/UPF Proteomics Unit is an innovative core facility that offers proteomics methods to the scientific community. As a reference centre, the unit is one of the best-equipped in Europe, with several high-performance liquid chromatography and electrophoresis systems, and three advanced mass spectrometers. Specifically, the unit currently has two LTQ-Orbitrap mass spectrometers, a QTrap mass spectrometer, three nanoLCHPLC, and a microLC-HPLC. The available instruments cover the most advanced techniques of the proteomics field, and are accessible to national and international scientists. The unit is part of the EU Meril initative and of Prime-XS, prestigious international consortia that grant access to state-of-the-art technology to the European research community. e x t- g e n e r a t i o n s e q u e n c i n g (NGS) is becoming the reference of medical genomics. Our two next-generation sequencers, MiSeq (Illumina) and GS Junior (454 Roche), fulfil small-scale NGS project needs. We also offer Sanger sequencing and small/ medium-throughput real-time PCR services, among others. he Microarray Analysis Service (SAM), with the AffymetrixGeneChip® research and diagnostics platform, offers an integrated service for cytogenetic, genomic and transcriptomic studies. The experimental services offered are the sample quality, quantification and microarray processing. Experimental design consultancy, statistical data analysis and orientation to its biological interpretation with specific tools are also included. Arrays of human, mouse and other species are available. his service is offered by the proteomics and protein chemistry unit at the UPF. esearchers at CREAL provide consulting services and technical assistance to public administrations and private companies in environmental health issues directly related to their research experience. They carry out studies or reports of potential hazards and/or public health recommendations. he Analytical Services and the Anti-Doping Laboratories are ENAC ISO 17025, WADA and AORC accredited technological platforms that use liquid and gas chromatography coupled to different kinds of mass spectrometry, immunological analyses, surface plasmon resonance and analytical information network management. 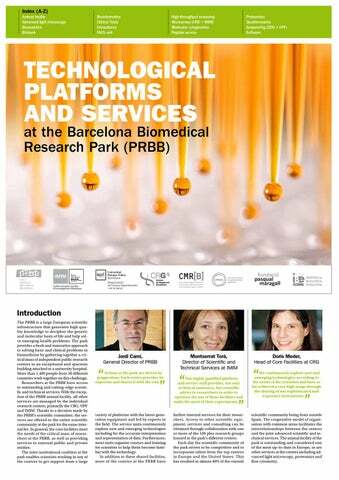 Special El·lipse 62: "Technological Platforms and Services at the PRBB"